Deborah lives in North Texas with her husband, German shepherds, and cats, and divides her time between Texas and Great Britain. Her latest novel, NO MARK UPON HER will be published by William Morrow February 7, 2012. She is currently working on her fifteenth Kincaid/James novel. "Metropolitan Police officer and Olympic rowing hopeful DCI Rebecca Meredith goes out alone to train on the river in beautiful, historic Henley on a dark afternoon in late October - and doesn't return. When a desperate search by the police and a K9 team reveals the possibility of foul play, Scotland Yard calls in Detective Superintendent Duncan Kincaid. Then, when a search-and-rescue team member's life is threatened, Kincaid realizes the case may be even more complex and dangerous than he believed. But it is only when he enlists the aid of his partner, Detective Inspector Gemma James, that they find the answers lie closer to home than they could have imagined - and are infinitely more deadly." I meant to write about the gorgeous town of Henley-on-Thames, where my new book, NO MARK UPON HER, is set. And about rowing, and canine search and rescue, and the fascinating things I learned and did that went into this story. But I'm sure I'll write and talk about all of those things in other places, and since Kaye has very kindly given me the opportunity to meander and muse, I'm going to do just that. The beginning of Sergeant Pepper's Lonely Hearts Club Band has been running relentlessly through my head the last couple of weeks. NO MARK UPON HER comes out on February 7th, so I've been more than an little caught up in all the stuff you do to promote a new book and getting ready to go on a book tour, as well as working really hard on the book-in-progress. Then all of a sudden the little wheels went clickety-click in my brain and I realized that it was the second week in February, in 1992, when I got the call from my (newly acquired) literary agent telling me that my first novel, A SHARE IN DEATH, had sold to a major publisher. And not only my first novel, but the unfinished second novel, and the only-contemplated third novel. A three-book contract. With Scribner's. As in Charles Scribner's Sons. There was dead silence on my end of the line. The seconds stretched, and stretched, and finally my agent said, "Did you understand what I just said?" I said yes, I thought I did, and hung up. Someone asked me in an interview recently how I felt when I knew I'd sold my first book. Stunned, I had to answer. Just stunned. And terrified. Something that had been a daydream, a "do just to see if you can" endeavor, had become suddenly, unimaginably real. I'd had a fun idea: Write books set in the UK so I'd have an excuse to go back often and visit cool places. I'd had a mission of sorts: Assuming I could actually sell a series (never mind one book,) I wanted to write about characters who weren't static, who grew and changed and had relationships and became better or worse for it. But I had no idea if I could actually do it. I felt like such a fraud. A) I had no experience that remotely resembled that of the Scotland Yard police officers I was writing about. B) I wasn't British. And a very big C) I wasn't a REAL writer. I'd never even published a short story. Fast forward almost exactly twenty years. Yikes. Makes me dizzy to even contemplate. I'm now with my third publisher in the US, Harper Collins, and very, very happy there. My agent and I have been together longer (and possibly more happily) than many marriages. I've written fourteen novels and am working on the fifteenth. Now that is not a great track record for productivity, I am the first to admit. I know many writers whom I admire greatly who write two books a year. I haven't averaged one a year, and some gaps have been longer than others. I've spent a good part of that twenty years castigating myself because I don't write faster, trying to find the perfect formula, the magic bullet, that will speed the process up. And then, suddenly, around the first of this year, as the pub date for NO MARK drew nearer, it hit me that I have written FOURTEEN novels. Now, I know that sounds daft, and I don't mean it in the literal I-suddenly-learned-to-count way. Nor is it that fourteen is a magic number or such a great volume of work--I have friends who have written FIFTY novels. I've written fourteen books that I still like (especially NO MARK UPON HER!) and I'm absolutely loving the book-in-progress. My characters and their lives have grown and evolved in ways that I could never have begun to imagine twenty years ago. Every book is like a surprise party. I don't mean that I don't plot, because I do, sometimes past the point of all common sense. But it's the things that happen in the spaces between the plans that never cease to amaze me, and the way that the characters and the stories come to life as the words go down on the page that has brought me unforeseen delight. Not to worry. I don't mean that I've given up trying to figure out how to write faster. I suspect that is the Holy Grail of my journey. Or that writing has ever gotten any easier, or that I've ever reached a point where I felt like I could wear the badge that says REAL WRITER. But maybe I've had an inkling that there's a Velveteen Rabbitishness to this writing business--the more you do it, the more real you get. And that maybe it doesn't even matter, because the joy is in the doing itself. Debs - Hi and Welcome, Sweetie! And are you over the moon?! You must be over the moon! 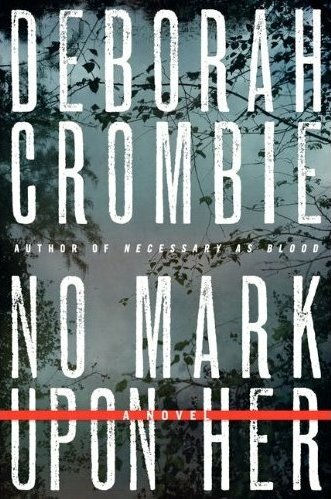 Publishers Weekly has chosen NO MARK UPON HER as one of their picks of the week. oh, wow - this is terrific! Congratulations! I'm proud to have you here, and yes - you made me cry. Hi Kaye! You know how thrilled I am to be here--and a day early! What a lovely surprise. I hope people will drop in and say "hi"--I'll be checking in over the weekend. You'd think as many times as I've launched book, I'd be blase about the whole thing, but I'm SO nervous!! The support of good friends like you means loads. PS: The bottom pic is Kaye, me, Marcia Talley, and Kate Charles at Bouchercon in Baltimore. We had such fun! What an achievement! You've given us all those wonderful, intelligent, deeply nuanced novels and you just keep getting better. Duncan and Gemma are so real, so human -- and, of course, it's always a treat to see the UK through your perceptive eyes. Oh, what a wonderful post. I am a HUGE fan of yours, Deborah, and am looking forward to reading your latest. I laughed out loud when I read about your shock upon signing. 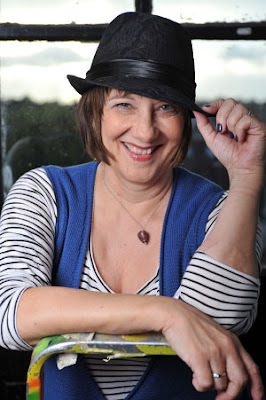 I have recently sold a traditional mystery series to Berkley to be set in a London hat shop (I'm obsessed with the British obsession with hats) and am now freaking out because I've never even been to London! Honestly, what was I thinking? The fact that you have written such a brilliant series inspires me! Thank you! Wonderful post Debs--I'm so glad I finally got the chance to meet you IN PERSON at ALA. Your series reaching to 15+ books is truly amazing in this day and age of impatient publishers and readers--you should only be patting yourself on the back! I love this story and I can't believe I hadn't heard it! I know just what you mean, that feeling in the beginning that you're perpetrating some kind of fraud. You mean... they're going to PAY ME to write?? I discovered your books last december only. Love everyone I read and will be happy to read No Mark Upon Her. How many you write isn't important as long as they continue to be good ones. Deborah, I hate to admit it but "No Mark Upon Her" was the first book of yours I've read. I thoroughly enjoyed it, however, and I guarantee that it will not be the last of yours that I read. All the best. Deborah, I love how you inspired our own Kaye with this post. It might be a lark...you might not even believe it can happen...and then one day it does. Wow. A 3 book deal with Scribner your first time out. There's a Moment. I can just about imagine your shock. It sounds like you found a wonderful pace for you. 14 novels is nothing to sneeze at. And 14 novels people love is even less sneezable. Such fun to see so many friends here, and new ones, too, I hope. There is more to the first book contract story: The first editor I sent A SHARE IN DEATH to was at Avon. When he FINALLY got around to reading it, he kicked it upstairs to Morrow. Although Avon/Morrow expressed interest, I ended up at Scribner's for five books, then Bantam Dell for three, and then William Morrow, where that first book started its journey and where I've been ever since. Talk about feeling as if you've come home! So I've been very fortunate in my editors and publishers all along the way. Greetings, Deb, from another North Texas writer, and thanks for a very delightful recap of your journey to where you are now. Best wishes for even greater rewards in your next twenty years. Deborah, you have been a top fave of mine, since I read the first of your work, A Share In Death, just before I started keeping my (now huge) Masterlist, in 1996. I have the first two listed, and the third has a date read, August 1996, so that is at least sixteen years, for me, reading your books. And by the way, LOVING them! You have a way, as it says in your post, of keeping your characters alive, changing, going forward-certainly not static! I've loved learning more about them as we go. But also, your plots are always wonderful--they keep me interested and inquiring, and your ability to put in some red herrings without losing your threads and plot lines--you're a master! Setting too-you have it all. You liking your characters, and liking your settings and plots, does show. To me, that is what keeps a long running series alive-the author doesn't see it as a only a job-it's a joy. Keep it going! Thanks, from a reader, for your wonderful books about Duncan and Gemma and their life and their work. Great photo, Kaye, and thanks from bringing this good post today! Oh, I so much like this blog. I can't believe that you sometimes wonder if you are a real writer, and then again I can. We're a hard lot to convince of oit own worth at times. For the record Deborah. You are a real writer and a terrific one at that.